The Goonies: Never Say Die from Blueprint Gaming is based on the 1985 cult classic adventure-comedy, enhanced with One-Eyed Willy’s Riches and Bonus containing one out of six modifiers, and up to 500 coins per payline! Unless you’ve been living under a rock, it’s hard not to have seen the 80’s movie about a group of young misfits who outwit bumbling criminals to discover One-Eyed Willy’s lost treasure. There was Brand, Mikey, Mouth, Stef, Andy, Data, Troy and Sloth. The slot recaptures this warm adventure with superb graphics, music and audio effects borrowed from the movie. Symbols included are a gold treasure chest, skeleton, gold filled balance scale and the super stacked skull & crossed swords flag. The four lower-paying symbols include the K, Q, J and A. The key wild is a way of helping you create winning paylines with this symbol substituting for all others except One-Eyed Willy’s skeleton scatter symbol. This key is also instrumental in the particular formation of winning paylines where 2, 3, 4 or 5 starting from left to right will reward coins in numbers of 2, 40, 100 and 500 respectively. One-Eyed Willy’s Riches feature can be randomly triggered during the base game and include one out of six features: Truffle Shuffle Wilds, Mikey’s Hidden Riches, Data’s Colossal Symbols, Mouth’s Lucky Coins, One-Eyed Willy’s Bonus Boost or Sloth’s Win Spin. They can either create wild overlays, stacked wilds, transform three reels into colossal reels, create a mystery symbol, add bonus symbols or guarantee an award. The One-Eyed Willy’s Bonus is triggered with three or more One-Eyed Willy skeleton scatter symbols that can appear on any reel. When this happens this is your entry to the bonus which spins to unlock one of six bonus features. These features are: Skeleton Organ Bonus, Fratelli Hideout, The Goonies Go Wild Free Spins, Super Sloth Free Spins, Inferno Free Spins or One-Eyed Willy’s Treasure Bonus. Fratelli Hideout invites you to select one from three skeleton keys to collect a cash multiplier of your total bet. Skeleton Organ Bonus can award total bet multipliers. Super Sloth Free Spins takes you to a new set of reels starring the Fratelli family where symbols can be transformed into top-paying symbols together with free spins. 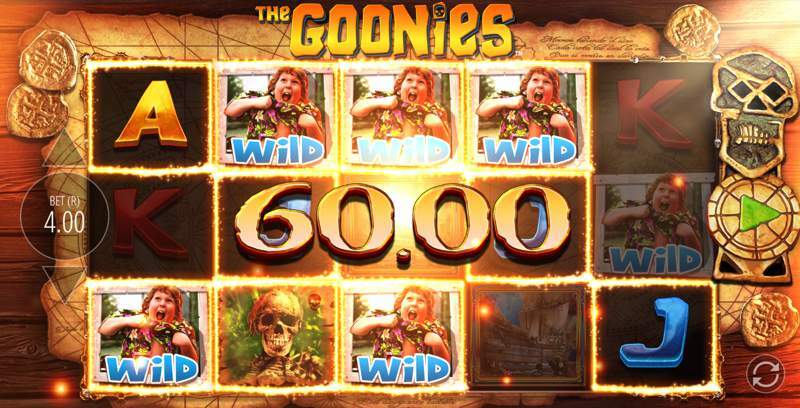 Goonies Go Wild Free Spins transforms one of the top reel symbols into wild together with free spins. Inferno free spins have the inferno move left to right across the reels transforming anywhere from 1 to 3 consecutive reels wild in combination with free spins. One-Eyed Willy’s Treasure Bonus awards a bet multiplier. The Goonies: Never Say Die slot has an RTP of 96.00% and is available on mobile, tablet and pc. This mid-to-high volatility, 5-reel and 20 fixed paylines slot follows you anywhere using an Android or iOS device. 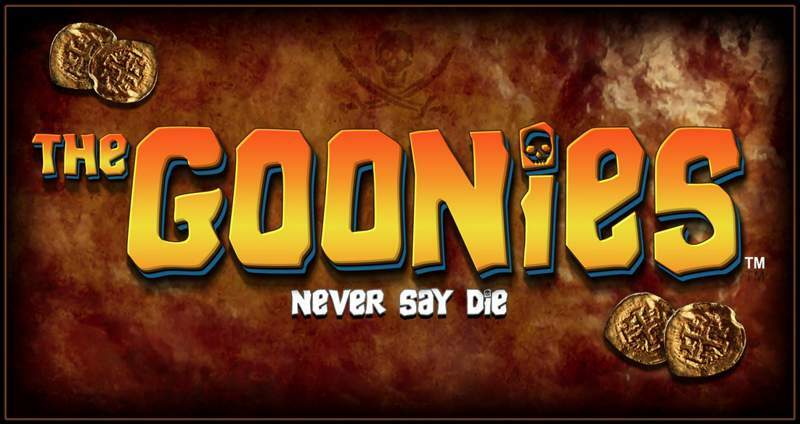 The Goonies: Never Say Die is an awesome slot game with multiple bonus features that keep the spinning interesting.